I’ve encountered Evan Williams before. 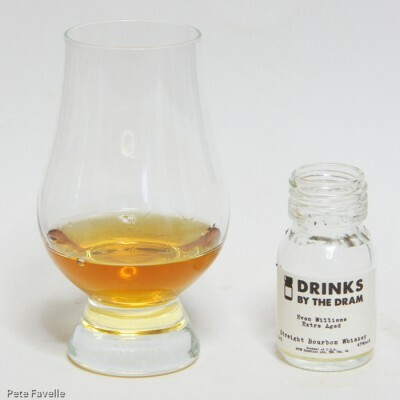 Their Single Barrel 2003 showed up in last year’s Whisky Advent Calendar, and I think was probably even responsible for me starting to daydream of a dedicated Bourbon Calendar! Indeed, I think I’ve encountered today’s dram before although back then it was simply labelled as Evan Williams Extra. That was several years ago, though, so it will be interesting to see how my taste buds have developed (or not!) in that time. Evan Williams Extra Aged appears to be what Evan Williams themselves refer to as ‘Black Label‘. It’s described as being aged “far longer than we are required to by law”, although at 7 years it’s obviously not in the same league of ageing as whisky from the significantly colder climate of Scotland! The nose is more alcohol-heavy than the 43% ABV would suggest; once that dissipates green apples come through, some light vanilla sugar and a whiff of charred wood. Water gets that alcohol under control, but leaves the aromas otherwise unchanged. In the mouth it’s sugar water, with a quickly building oak tannic background. There’s tiny hints of creamy vanilla, but not a whole lot else. Watered, it’s a little more balanced but it still lacks much depth – some light caramel, a little hint of oak in the finish but otherwise unexciting. It seems my 2012 self was similarly unimpressed, even if I did rather unfairly label it a “young bourbon”. 2 stars; there isn’t anything actively wrong with it, it’s just a bit dull.